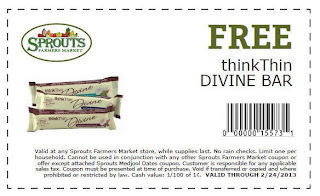 Get a free ThinkThin Divine Bar Sprouts. Click the link below to print the coupon. Redeem your coupon at your local Sprouts Market. Valid through 2/24/13.